I got a headlamp for Christmas. It was a nice Black Diamond with dimmer and red LED (possibly a Storm?). Turns out, headlamps are much more useful than flashlights. Lee kept borrowing it, and Boo really wanted one. So I got Boo the kid’s Black Diamond. It’s light (2oz according to REI) and has a sweet octopus twisting around the band (looks like new designs this year, also pretty cool). It's distinctly smaller than mine, much better for a kid-sized person. The battery compartment has a screw, which is nice from a losing batteries and safety perspective. I’m afraid I’m going to lose the tiny screwdriver that came with it…. It throws a nice bright light. Not a spot, but not totally diffuse, either. She's not confidant enough in the dark to go running in it, but it's plenty for an evening stroll or potty run. It only has on/off, which I think is best for a 5-year-old. She wants it to dim and have a red light, which I think is more complicated than she needs. Other than not being as complicated as mine, she loves it. It has the same feel as the adult Black Diamond headlamps I've handled. Same strap type and setup, same general case thickness, same tilt mechanism. 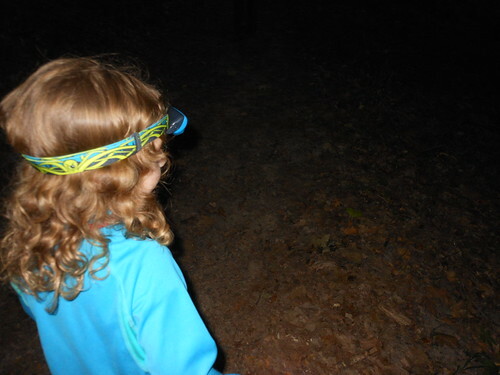 I prefer the headlamp because I'm less likely to get flashed in the face, and it's easier for her to keep track of than a flashlight. Boo says, "I like it a lot. It's very good. I use it to see when we're going camping in the dark and when I go potty at night. (Is it comfortable?) Um yeah. (Is it easy to use?) Yeah, all you have to do is put your finger on it and push." How do your kids see at night? We keep suggesting headlights on the Cubs kit list but they usually get the spare torch from under the stairs, one was bigger than the Cubs head which was a laugh.